Who loves Scooby Doo? Well, I do. I used to watch those wacky episodes almost every day when I was a kid. I never knew that Scooby is actually a Great Danes until now no wonder he is that big. Though fierce as it looks Great Danes are gentle giants and they are friendly in nature. But before they were made pets these German breed dogs are used for hunting boars, deer, and bears centuries ago. They also made quite of a reputation as dependable chamber dogs for German nobilities to guard princesses against assassins while sleeping. Centuries ago they are being fed with raw and pure meat where they get all the nutrients and calories they needed, unlike now we depend too much on commercial dog fo﻿﻿ods to feed them. With the vast selection of dog food available in the market, we don’t know which one is best suitable for our pet. So today we will discuss it and we will show you how to find the best among the rest but first let me tackle some important things regarding Great Danes. What Makes Your Great Dane Healthy? What To Look For In Great Danes Dog Food? Bag Size: 5 sizes from 4. lb to5 28 lb. Well, I could say that this dog food is simply the best. It uses LID (Limited Ingredient Diet) dog formula that is excellent for those looking for an alternative ingredient for dogs. This dog food is designed to provide large breed dogs with a healthy digestion and excellent coat and skin condition. Its formula promotes healthy gums and teeth and at the same time encourages large breed dogs to chew properly and eat slower. Its primary ingredient is lamb meal which is also a good source of high protein and it doesn’t contain any preservatives and artificial colors. 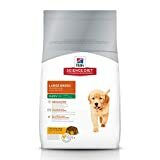 This is specifically made for large breed puppies up to 1 year of age weighing 55 lbs. It contains high level of calcium that aids in bone growth and development needed by large breed dogs. It is a premium dog food packed with nutrients and antioxidants for better immune system that guards your dog against infection and unwanted diseases. It doesn’t contain any artificial colors, flavors, and preservatives that can harm your dog in long term consumption. Bag Size: 6 sizes from 5 lb to 33 lb. If you want your dog to have lighter and leaner muscles then this is the type of food you want to buy. It made from real chicken as the first ingredient which is a great source of high protein. It has a special formulation of good fiber coming from Beet pulp and Pre Biotic FOS that promotes better nutrient absorption and healthier food digestion. This dog food also contains supplements like Glucosamine and Chondroitin that helps to support healthier joints. It has optimal levels of Fatty acids like Omega 3 and 6 that promotes shiny coat and healthy skin. Bag Size: 2 sizes from 18 lb to 34 lb. Made from real chicken which provides the building blocks that an active dog needs and this are specially formulated for puppies weighing 50 lbs. It comes in kibble size for better chewing and easy digestion. This is part of Purina’s Pro plan that promotes well-balanced nutrition to large breed dogs like your Great Dane. It contains DHA that helps nourish proper brain and vision development, while minerals like Phosphorus and Calcium promotes building of strong teeth and bones. Bag Size: 4 sizes from 4 lb to 26 lb. This US made product is a 100% natural grain free & is made from Deboned Chicken, Deboned Turkey, and Salmon Oil. It comes in smaller kibble size filled with essential nutrients and antioxidants for a better and healthier skin and coat. This is a premium quality dog food with no meat by products and fillers that can harm your dog’s nutritional diet. It has no preservative, artificial colors, additives, corn, wheat and soy that usually gives your dog allergies and skin irritations. Great Danes like any other dog's with big size have a slow metabolism which usually results to weight gain and Obesity. This excess weight poses risk and can affect greatly to your do﻿﻿﻿﻿g﻿’﻿s﻿ h﻿ealth and day to day activities like playing and running. Danes are fast growing giants so it is important to make considerations for the feeding style and food nutrition that you give to them. To achieve a steady growth development we have to feed them regularly with a well-balanced & nutritional foods. There are three important elements that can make your Great Dane stays in good shape. These are essential to your dog’s overall wellness and health. A well-balanced diet with food nutrients that is specific for Great Danes. These nutrients are based on the minimum required amount to maintain a certain dog's health. These unique nutritional requirements are based greatly on the dog’s size, type of breed and age or life stage. Water means life and it plays a vital role in maintaining your Great Danes’ ideal body weight and physique. It also helps your dog in neutralizing elevated body temperature as well as in releasing toxins from the through urination. Water also aids in carrying and moving of nutrients in and out of the cells so that the body can function normally. An immediate access to a clean and potable water will be very beneficial your Danes health. It must be refilled and changed every day, especially in hot days to keep him hydrated and refreshed at all times. During the long period of walks and playing your dog will start to show panting and salivation, these are visible signs that your dog is thirsty. Ideally, Dog's must consume or drink approximately 1 oz. of water per pound of body weight daily. Anything lesser than this due to habitual neglect from the pet owner will compromise the dog's health or even risk its life of having kidney failure. A regular walk and play in the outdoors is a good exercise for your dog, it is good for the heart actually for both the pet and the owner. It also builds a stronger bond between the two and makes your dog emotionally and mentally healthy. Studies show that a regular exercise and playing reduces dog problems that many pet owners are experiencing. Unwanted behaviors like digging, destructive chewing and scratching are less found to dogs who play outside regularly than those who do not. 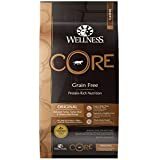 Can I feed my Great Dane a regular dog food? No, I don’t think so. Regular dog foods normally contain high amount of protein and other nutrients that are not suitable for Great Danes diet. Though it is essential for your dog to have the same list of nutrients that another dog is getting, there are some that are needed to keep in moderation. Remember that Great Dane grows very fast and without control to his diet could someday lead to a lifetime disability or worst death. AFFCO stands for Association Of American Feed Control Officials. This organization is well known and respected by the people in the food industry. They don’t have any regulatory power neither rejects or accepts pet foods. But when their name is written on the food labels it is being recognized and perceived by many consumers as a merit for the level of excellence that the food product acquired. You dog food should have a precise and clear printing of its Nutritional Facts and Values and their recommended feeding amounts per day. The Ingredients should be well presented as well as the Guaranteed Analysis of the nutrients found in the product. Through this, we can easily identify if the product fits to your dog’s needs. Below is the list of the required level of nutrients recommended for Great Danes. Protein: 22 to 24% and should be the main constituent of your dog food. Calcium: 1 to 1.6%, this mineral aids greatly in skeletal growth. Fat: 12 to 14 %, this is in the form of fatty acids and is being supplemented to increase your Danes brain function and prevents inflammation. A controlled and nutritionally enriched diet is necessary for your dog’s proper development. When feeding your Dane, consideration should be made according to the dog’s life stage, food restrictions, and daily activities. Supplements are not necessary because most premium dog foods are already packed with these things unless required or recommended by your Vet. Here are some steps that you can follow in feeding your dog. It is advised to know first your dog's life stage and his needs. It is very important to identify your dog's stage in life to create a baseline what kind of dog food you are going to feed him. By doing this you can understand the healthy requirements needed on a daily basis. The stages of canine life start from puppyhood and may end as early as six months. Adolescence period will then follow and may continue until 15 months of age. At approximately 18 months your dog will reach its full maturity. In these life stages, food nutrition and form of feeding may undergo a transition to compensate greater nutritional requirement of your developing dog. Know how much your dog needs. You can do the free feeding or not. Minimize in giving treats to your dog. Select a suitable feeding place in the house. Great Danes because of their giant stature becomes more prone to health problems that we should be aware of. Here are some of those that might want to look at. This is also known as GDV (Gastric Dilatation- Volvulus) and this is highly progressive & life threatening. It is commonly associated with large meals consumption wherein the body twists or rotates leading to dog’s fatal death. This a debilitating disease wherein an abnormality is present in the dog’s hip socket. In severe stage, can result to crippling, lameness and arthritis. It is painful and degenerative and can impede your dog to perform its daily functional activity such as walking and running. This type of heart disease is common to large and giant breed dogs like Great Danes. This is a condition where the heart muscles suffer enlargement could be due to inactiveness and lack of regular exercise. Also known as CSM (Cervical Spondylomyelopathy) is a type of cervical or neck disease usually occurs during dog’s adolescence stage. This affects dog’s gait pattern and coordination. It is a rare condition where an excessive or overproduction of Thyroid hormone happens. This results in increased metabolism accompanied by Anxiety, Diarrhea, and weight loss. 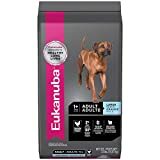 Finding the best dog food for your Great Dane is not an easy task but they truly deserve it and keeping them healthy and in good shape is only right for they make us happy in return. It is always been advised to be more selective and precise in choosing the best dog food for your pet because there is a lot of dog food manufacturer out there that is more concerned with their profit than to your dog’s welfare. 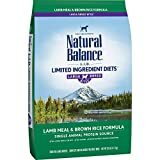 For me the Na﻿﻿t﻿u﻿﻿ral﻿﻿﻿ B﻿﻿alance Limited Ingredient Diets Dry Dog Food is the best and most suitable for your Great Danes needs. This dog food is ideal for keeping your dog’s weight controllable which is the most vital aspect of your dog’s healthy regimen. Do you have any tips or suggestions? Feel free to do so in our comment section below.